Join us to our 2-day conference led by academic and business experts. 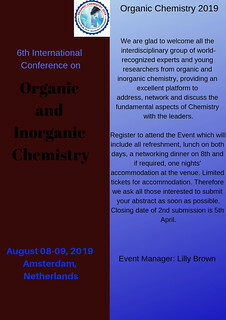 Covering the aspects of organic and inorganic chemistry, each session sure offers you to explore and optimize your research. All accepted abstracts will be published in the respective Conferences Journals. Accepted abstracts will be included in the conference proceedings which are to be distributed at the conference. Each abstract will receive a Digital Object Identification Number (DOI) provided by CrossRef. Registration will include all refreshment, lunch on both days, a networking dinner on 8th and if required, one nights' accommodation at the venue. Numbers are limited. Therefore we ask all those interested to submit your abstract as soon as possible.